Dear Sherri: Why Does My Oncologist Always Ask Me How I Am Feeling? Shouldn’t He Know?! One oncologist says he always asks patients “How are you feeling?” and many respond “Well, Doc, you tell me.” He says he really wants to know….because tests only tell him so much–he needs to hear from the patient. Still, I hate to complain. Any advice? If a physician asks, tell him/her. Yes, your chart has been reviewed and your vitals have been noted but he/she wants to hear from you how you are feeling. Objective data tell a care provider only so much. What you often start out with is what is on your mind. Your nurse or your physician can then delve deeper and get to the heart of the matter. Paper and computers don’t give the full picture. On several occasions my oncologist has referred me to other doctors at the same institution. For example, after a thyroid nodule was seen on scans, I was sent to a specialist. All of these specialists start out with “Why are you here?” What’s up with that? As odd as it sounds, sometimes physicians and nurses will ask a seemingly obvious question to a patient to ascertain the level of understanding the patient has for the topic at hand. Over the years I have learned a huge amount by asking and then listening to a patient’s response. I remember years ago while preparing a patient for surgery, he had been asked about his NPO status (nothing by mouth after midnight) which is a crucial question to have answered prior to anesthesia induction. We don’t want any patient with a full stomach coming to surgery and then being sick. It can lead to all kinds of trouble. Anesthesia asked this gentleman if he had eaten or had anything to drink since midnight and his answer was no. A colleague of mine who worked in the pre-op area asked later and indeed the answer was no. As I was going through my list of questions, I asked a third time. This was his response, “Well, I had a biscuit and a cup of coffee because I knew it was going to be a long day.” Case cancelled! I have decided to get a second opinion but I feel like I am insulting my doctor. Help! If you don’t feel comfortable with the information you have been given for any reason, you have every right to seek a second opinion. Physicians are used to patients doing that. The only potential challenge might be if you had two very divergent care plans. Then you would have to decide what to do. You have the right to be well informed in layman’s terms about your illness, possible treatments and likely outcomes including unexpected outcomes, and to discuss this information with your doctor so that you may make an informed decision. You have the right to consent or refuse medical care or treatment, as permitted by law, and to be informed of the medical consequences of such refusal. If you refuse a recommended treatment, you will receive other need ed and available care. 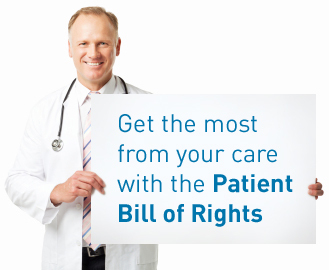 You have the right, except for emergencies, for the physician to obtain necessary informed consent prior to the start of any procedure or treatment or both. Should I provide a new physician with a quick oral history? Surgery is not standard of care for metastatic breast cancer, but my doctor thought it was worth considering. He sent me to a surgeon–the surgeon was arrogant and basically stressed my Stage IV status. What a waste! Couldn’t my doctor have spoken with the surgeon prior to my appointment? Yes, they should have had a conversation prior to your visit. When a physician wants a patient to see another physician, this is called making a consult. It can be done via the computer or through a phone call. A brief outline of the need for the consult and the expected outcome of the meeting should be noted and understood by all. Now to the surgeon part. I am sorry for the arrogance displayed by the surgeon. And in by no means am I defending him/her. (Remember I spent many years in the surgical arena. I have seen and heard it all.) If the surgeon was an oncological surgeon, I would expect a completely different response than if he/she was not. Although respect should be the foundation of all patient-physician relationships, I wonder if this surgeon was out of his/her comfort zone and was at a loss for what to do or say. It doesn’t make it right but it makes me wonder. Remember from the last Q&A I did, if you want the complaint to be dealt with, use your resources in the hospital such as the Patient Advocate or the manager of the department. Let him or her know your experience with this surgeon. Trust me. Hospitals want to provide compassionate care and if you feel you did not receive it during this surgical consult, administration wants to know. Do you have a question? A suggestion for a future Q&A? Please comment below. When were you diagnosed with metastatic disease? My primary diagnosis was in 2010, five days before my 50th birthday. We were scheduled to take the big 5-0 trip to San Francisco, one of my most favorite cities twelve hours after receiving the diagnosis. We made the trip, although a blur. It rocked me. I had bilateral invasive ductal carcinoma. They stopped counting at five tumors…I am ER+PR+ Her2+ – had bilateral mastectomies and completed my chemo regimen. Later I had reconstruction. I begged my husband to get me out of the town/state we were living in. Remember I had just moved there and then received my diagnosis? We moved to upstate New York but forgot to leave the cancer in Virginia. Six months after our NY arrival, I was diagnosed with mets to the liver, fall 2012. I made it 22 months off chemo before the spread. Chemo again. Clear until fall 2014. On chemo currently. I am on an odd two-year cycle. I want the world to know if the cancer doesn’t leave the breast, you don’t die of breast cancer. Unfortunately, while 70 to 80 percent of those treated for early stage breast cancer won’t have a metastatic recurrence, 20 to 30 percent will–and we don’t know who will have a metastatic recurrence. That’s something many people either don’t know or prefer to avoid thinking about. I love Dr. Susan Love’s quote: “You can be assured if the NFL is wearing pink, our nation is breast cancer aware!” Meaning, let’s move on beyond basic awareness to concrete action, people. Does being a nurse help or hinder? My frustration not being able to work keeps me blogging and keeps me at the computer researching and reading. I also review articles for the national organization Association of periOperative Registered Nurses (AORN). My friends and family think I can be too forthcoming, too objective but I cannot help it. I am a nurse. I have a terminal illness. Not enough is being done and I am going to talk and write about it. So, in that sense being a nurse helps put some weight (?) behind some of what I write about. Infusion Centers: How do they work? Having blood work as soon as you arrive – this allows the blood to be processed while you are having vitals taken and beginning to talk to your physician; bloodwork will be run stat which is hospital lingo for being completed within 60 minutes. I have heard of facilities which require you come in on a different day than treatment. That doesn’t sound patient-centered to me and it could cause delays on treatment day if they can’t find your labs or if you need to have them redrawn. I encourage patients to bring in written down questions. This makes the time spent with their physician much more efficient. I carry a small notebook around with me everywhere I go (read: chemo brain) so I have them ready to go when we are together. If you need refill prescriptions, take a look before you leave from home. Write them down in your book. This way when asked, you won’t have to think back on what you may or may not need refilled. While this seems like it is only impacting you, if you think of a physician’s day being a series of dominoes, keeping it efficient for yourself, keeps it efficient for others. Meaning an extra five minutes with you while you sort your meds out in your head added to the next person’s extra five minutes, leaves you if the afternoon patient potentially being seen later than you want. Also, if you forget a symptom or a prescription and end up calling back in to the office, remember that offices have different policies. Some will try and snag the doctor between visits and will call your drug in, while other offices will wait until the end of the day and make potentially dozens of calls to pharmacies. If your office does the snag and grab approach, your call has halted the progress of the flow of the center – not for long but when you add up multiple stops in a day, the flow is going to get backed up. *Note: don’t misinterpret, they all want to help. Don’t let this stop you from calling if you need to. Nurses and Techs: Do they understand MBC? This is my personal opinion and mine alone. Yes, I think the nurses ‘get’ it but if you were to ask my nurses over the past two years if I have pushed them to talk about death and dying, they would shriek, “Yes! A thousand times!” The truth is they don’t want to talk about it. Even though they are oncology nurses. And if pressed, they will admit it. They also didn’t like when I stopped the Perjeta I was taking. In fact my nurse was livid with me. Not kidding. Then the next time we were together she told me I had rocked her boat. That she had never had a patient tell her oncologist that she was stopping something when they weren’t at end of care. I simply didn’t want diarrhea 24hours a day, seven days a week. She told me she learned so much by having to look at someone else’s perspective. They will tell you, I push them – because I can! Make sure you clearly communicate your quality of life. If you feel as though your concerns or issues are being dismissed, it might be time to consider making a change in treatment providers. The techs? No, I don’t think they fully understand the nuances of the disease. I wish they did but in general, you have to think of them as bright but task driven employees. So, while they know the basics of some diseases, I would not expect them to talk at much depth about them. Who do you talk to if you have a complaint? It depends on the type of complaint. As a good nurse, I always knew I needed to go up my chain of command and for the most part, that would be a good thing to do – at least at first. If I had a complaint about an employee in my infusion department, I would ask to speak to the manager or director of the department. If you are so inclined, you could speak face-to-face at that time or ask for her business card to call her later. Inquire if your hospital has a Patient Advocate – these people spend their lives talking to patients and family members about a myriad of things. Nurse Navigator- Some hospitals have Breast Cancer Navigators who do a wide variety of things for the patient, from assisting with making appointments, to working with financial departments on the patients’ behalf to listening to any issues the patient might have regarding her care. My department also has a social worker, dedicated to oncology. This would be a resource. You can ask to talk to the Director of Patient Safety – this person is always on the lookout to enhance not only safety but the patient experience. You can ask to talk to a member of the Risk Management Department – in some hospitals Patient Advocacy is a part of this department. How do you have a good relationship with your medical team? I don’t think I have ever been asked this before! Well, you should never have to worry if your nurse or doctor is having a good day or not. They are there to provide care. But the human side of me (the nurse in me?) always tries to interact with each member. I know all too well the behind-the-scenes goings on and I do try to make my time with them pleasant. Sometimes I will say, “Boy, you must be tired. This place is really hopping today.” Or something like that. It humanizes us all. I think points I made up above would be appreciated by the staff: have your thoughts together, know if you need refills, have your questions/concerns in your head and thank them for taking care of you. Really, staff love to hear they are doing a good job. If you can, a nice note is always appreciated. (They get photocopied and placed in personnel files and can do wonders at evaluation time!) No need for gifts. Staff can’t accept them anyway but positive words to supervisors, managers etc. go a long way. But only say it if you mean it! If there are problems, see the list above for resolution! Both Sides Now: What Happens When a Nurse Becomes a Patient? I was born and raised in North Carolina about four hours from the coast. Summers were spent at the beach which is why I still love it to this day – everything related to water, swimming, eating all kinds of seafood, collecting seaglass, walking the beaches. My hope was to have retired to the outer banks of NC. Now I just spend as much time there as I can, while I can. I am married to a great man and between us we have four grown children, two working, two finishing college this year! They have all been marvelous as the disease has gotten more serious. The kids often come to upstate New York where we now live and we always have a great time. We live near the Finger Lakes so wine tasting is almost always on the docket. The week I was diagnosed, I went to the hospital for my first exam and for the scheduling of an MRI. My nurse navigator greeted me and my husband by saying, “You must stop by the wig boutique when you leave. It is the most marvelous place with all sorts of choices.” I had not yet decided if I was having a lumpectomy or a mastectomy. How did she know I would be bald soon? I don’t think I even knew her name at that point. I was so rattled by that comment I remember little else of the conversation and was glad that my husband was there to hear it on my behalf. Later I thought about all those patients who come alone and are smacked by something we as health care professionals say that has a completely different impact on the patient than we ever intended. A week later, I had not heard back about the results of the MRI. I called the nurse navigator, who said she would contact the physician. Four calls and two weeks later, the surgeon finally called me back and told me he had just reviewed the MRI with the radiologist. This is first thing he said to me: “Your MRI is a nightmare.” I was sitting on the couch alone in my new home and that word continued to reverberate in my head. Luckily I had a pen and paper, and as he talked I scribbled every word he said, hoping my physician-husband would translate for me. Later that day, one of the nurses came back and told me that indeed my lack of enthusiasm had him talking about me at the nurses’ station, wondering aloud why I wasn’t more pleased with the results. He was a great surgeon in every way, and today, two years later, I could give him the praise he wanted, but not then. Are we as health care givers in tune, perceptive, able to merge a task with the human component of compassion? I think we need to speak for patients instead of asking them to speak up. While I agree that patients should be active participants in their care, I didn’t have the voice (or the courage, energy, or fortitude) to ask my surgeon to postpone the task, or call a nurse in to be with me while he changed the dressing. Ultimately, the nurse manager reminded the plastic surgeon that I had lost both breasts within the last 48 hours. To expect someone to be happy under those circumstances was asking a bit too much. She spoke for me because I couldn’t speak up. Many months later, after my chemo treatment, when I had just gotten brave enough to face the world without my hated wig, I went to the hospital to have lab work drawn. While standing in line, I heard a phlebotomist say, “Hey there, Buckwheat.” I turned to see who was standing behind me but saw no one. I realized she was talking about me–and I nearly died of embarrassment right there. I had begun feeling a bit like my old self, and this woman, for reasons I still do not understand, thought she was being funny. I left the lab without having my blood drawn that day. Instead the hospital’s patient advocate found me (thanks to my husband, who worked there). After telling her my story, she advocated on my behalf with the laboratory department. She spoke up for me when I was too embarrassed to speak up for myself. Portions of this article originally appeared in “Speaking for the Patient” in the P.S. Blog, published by the National Patient Safety Foundation; used by permission of Patient Safety Insight. All rights reserved. You are currently browsing the MBCNbuzz blog archives for March, 2015.